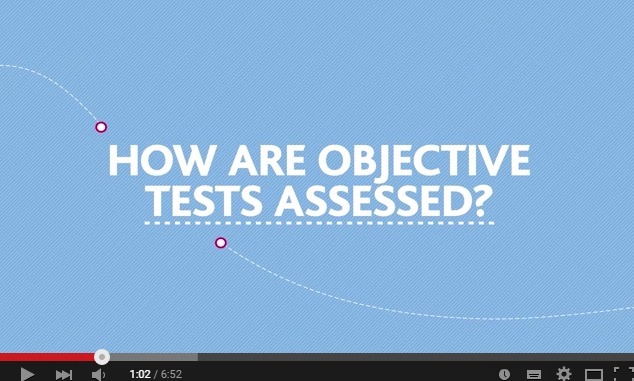 What your exams performance reports means to you ? What do your CIMA case study results means ? 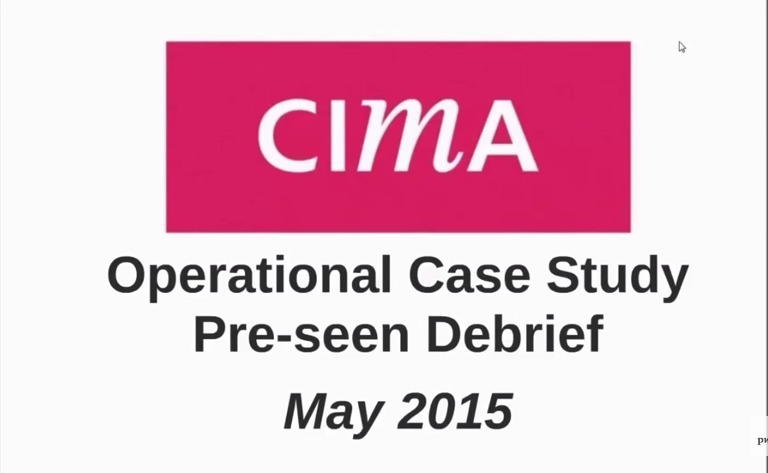 What your CIMA Case study exam performance reports means to you? How you can demonstrate those areas more efficiently ? There are some key tasks you want to do, these really could make the difference between a pass and a fail on exam day. The report is VITAL reading. It's the first chance we've had to really get to the heart of what the examiner is looking for. 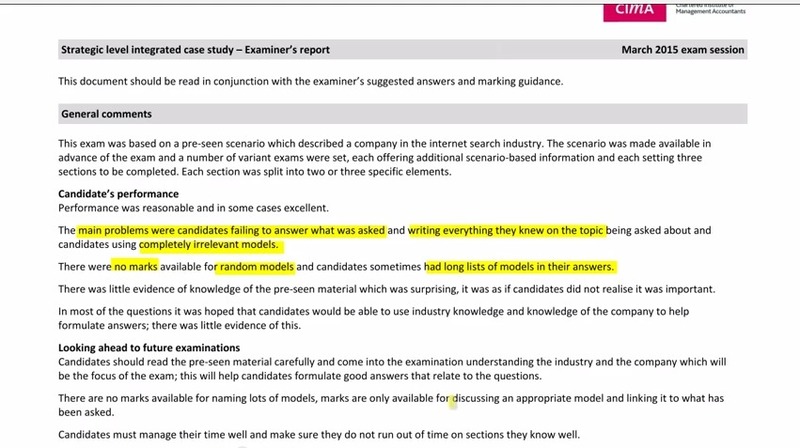 Reading the report and watching this video should help you to find out exactly what scores marks, what you should be including and what you don't need to include in your answers as well as many more key details that will be useful for anyone taking the exam. 2) Spend some time ensuring you are familiar with the pre-seen analysis and industry background. Consider the issues that could come up in the exam and the implications for the business. 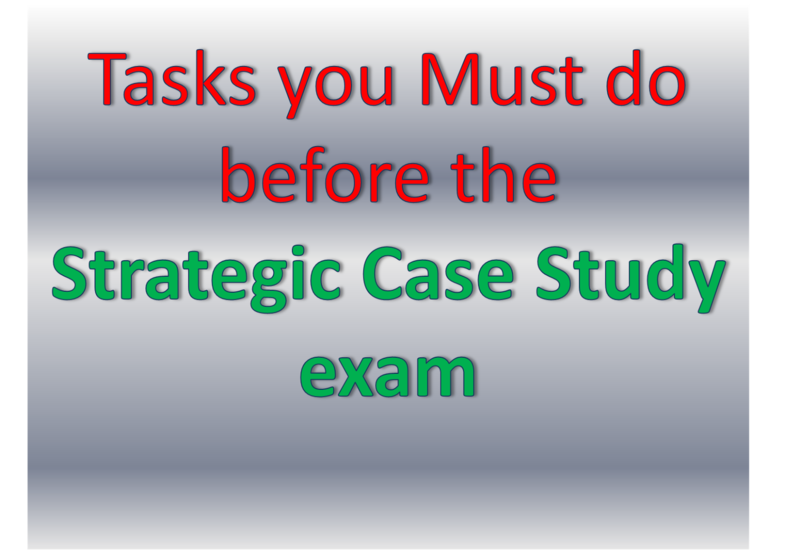 Being aware of these before you get into the exam will put you at a significant advantage as you will be able to write more comprehensive solutions. 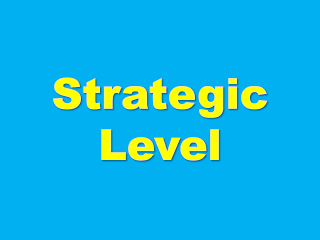 Your aim should be to complete a full script with each section being well developed. 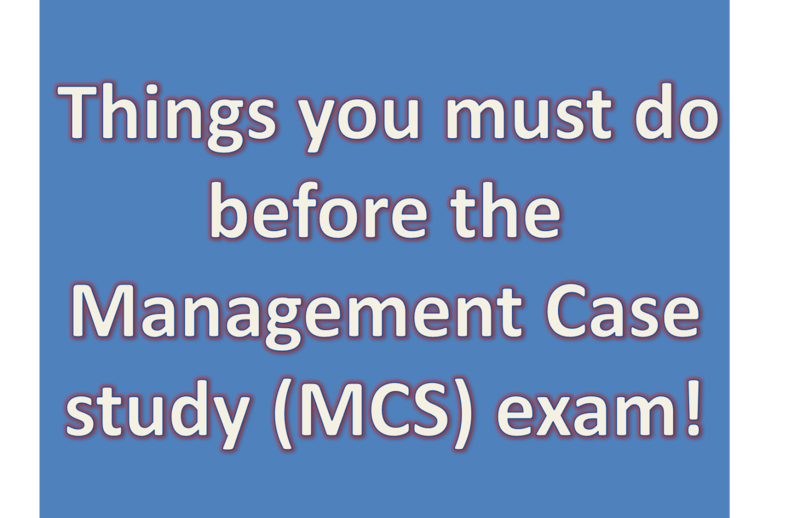 This will cement the exam practise you have been doing to date, and ensure you have your time management mastered. If you have time for two or three then even better! 4) Create a one-page summary of pre-seen facts to learn. (e.g. 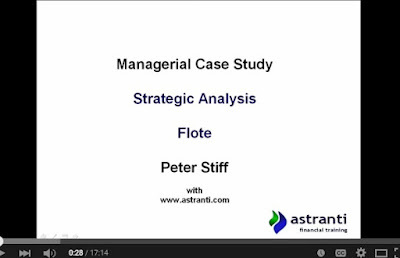 cash-flow statement, who are the people and what are the key figures). 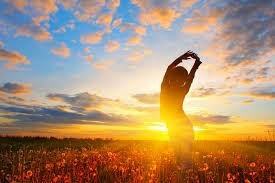 You do not want to be referring back to the pre-seen on the day of the exam as you simply do not have time, and your main focus will be on the unseen material. 5) Ask any outstanding questions. A full mock is probably a little too much, particularly for those of you at work, so a mini-mock exam is perfect for this day to firmly cement your approach. If you've not done it yet - attempt Astranti free mini-mock from the Members Area. 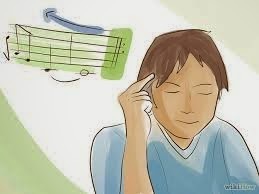 7) Write and memorise some pre-learned paragraphs. This can score easy marks in the exam. You should memorise paragraphs which take a piece of theory such as a model, explain how it works and then apply it to the pre-seen. 8) Revise key theories and models. 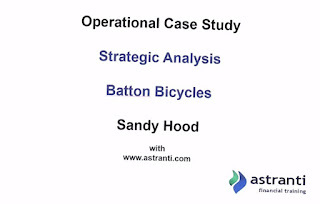 Review your key facts sheet and strategic analysis of the case pre-seen so they are fresh in your mind. 1) Spend some time ensuring you are familiar with the pre-seen analysis and industry background. 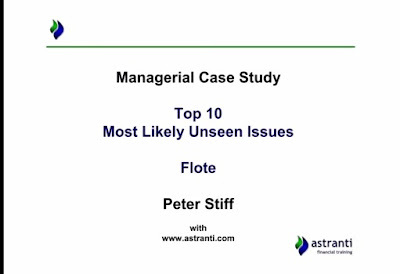 Consider the issues that could come up in the exam and the implications for the business. 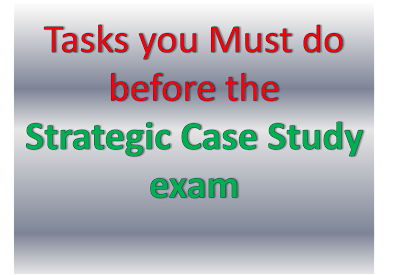 Being aware of these before you get into the exam will put you at a significant advantage as you will be able to write more comprehensive solutions. 2) Complete one final mock exam. 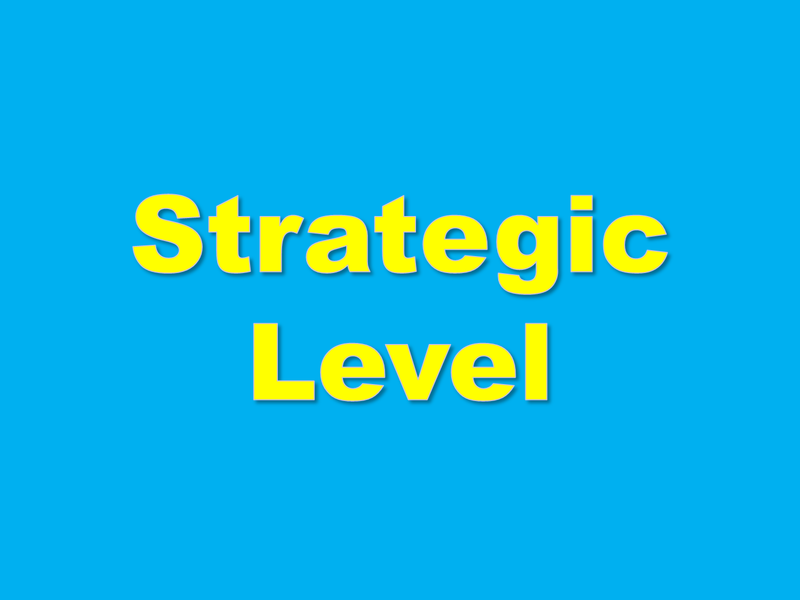 Your aim should be to complete a full script with each section being well developed. 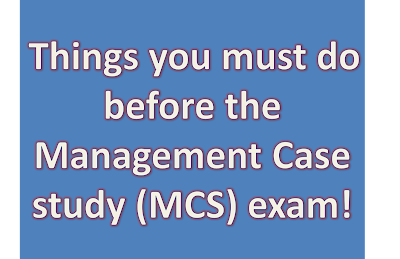 This will cement the exam practise you have been doing to date, and ensure you have your time management mastered. If you have time for two then even better! 3) Create a one-page summary of pre-seen facts to learn. (E.g. who are the people and what are the key figures). You do not want to be referring back to the pre-seen on the day of the exam as you simply do not have time, and your main focus will be on the unseen material. 5) Write and memorise some pre-learned paragraphs. It is vital that you learn all the key theory. You should know this by now of course, but one final review is important. - This is a great last minute revision opportunity. See full details below. The examiner's report for the March exam includes some really important points that everyone should be aware of. 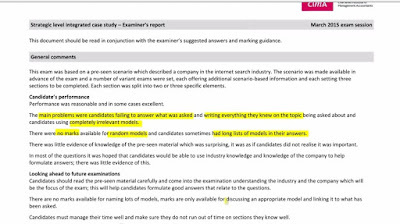 1 - “The main problems were candidates failing to answer what was asked and writing everything they knew on the topic being asked about and candidates using completely irrelevant models." 2 - "There were no marks available for random models and candidates sometimes had long lists of models in their answers." 3 - "There was little evidence of knowledge of the pre-seen material which was surprising, it was as if candidates did not realize it was important." 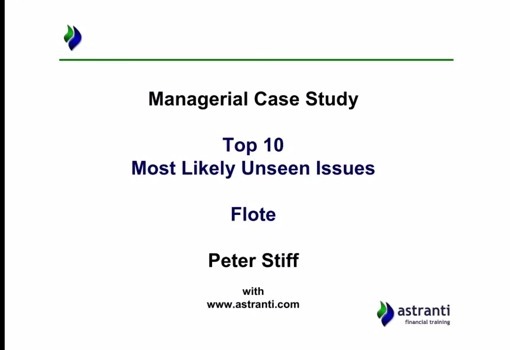 4 - "In most of the questions it was hoped that candidates would be able to use industry knowledge and knowledge of the company to help formulate answers; there was little evidence of this. It's clear from reading the report that the examiner wants detailed, specific and APPLIED answers. Many student's fall into the trap of writing down everything they know on a subject and fail to answer the question that was asked. It is vital that your answer relates directly to the question asked and you must ensure that all the theory and models that are used are relevant! A great way to avoid this mistake is by having good plan and a structured writing approach. This will ensure the requirements of the question are fully understood. Read the full examiner's report here. 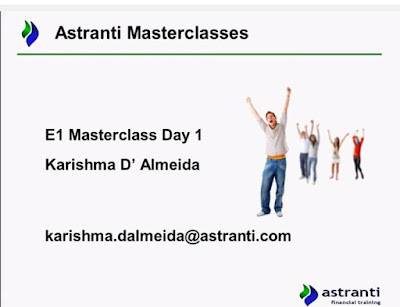 Astranti have 3 masterclass for each secession They are hosted online and are recorded for students that cannot attend live. Get motivated and ready to work hard! 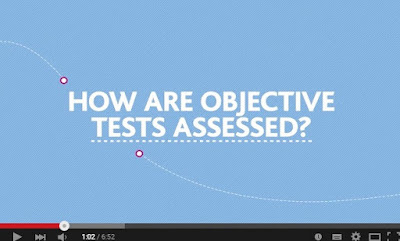 How does the exam work? How is the MCS marked? What are the easiest marks and how to get them. A key issue for many; how should you manage your time effectively? 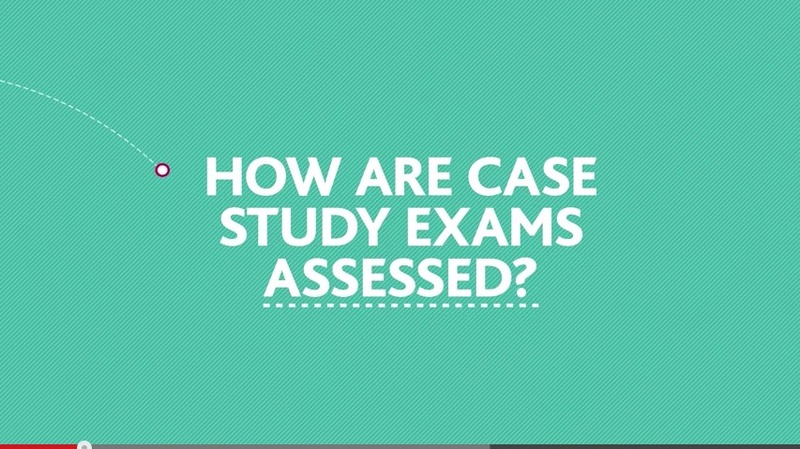 How can you save time in the exam? What does an excellent script look like? How to prepare – it's not longer just about knowing theory! The importance of hard work! - How well did you plan your answer? - What you you still need to do to improve your planning? 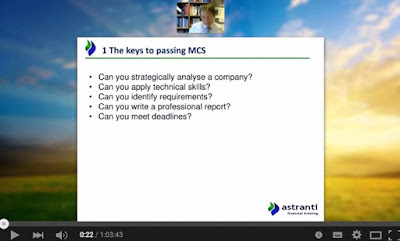 How to identify the key requirements - What errors did you make in your mock and how can you ensure you don't do that in the exam? How to manage your time effectively - How did you manage your time in your mock and where you YOU still need to improve. - Your mock - how many marks did you lose through your writing style? 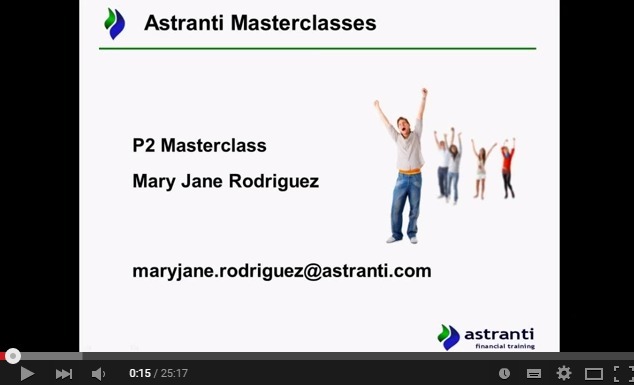 - How should you improve your writing style? What does a great exam answer look like and how good is yours? - Are you prepared for them? The examiner reports for the March exams have been published. My advice is to read them. There are 12 sides for 5 exams so that isn't excessive. On that basis try to consider this possible scenario. of 20 million borrowed for 2 years. Which costs should be included in the cost of the factory that will reported on the statement of financial position (no depreciation to be charged)? If the OCS examiner suggested adopting some of the mechanisation in the Batton production line are you prepared for a response? 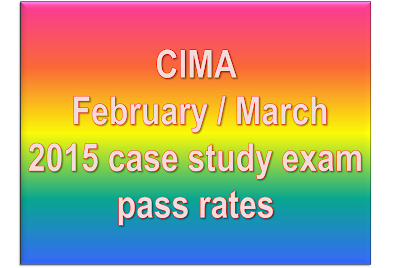 CIMA has published the pass rates for the case study exams held in February and March 2015. 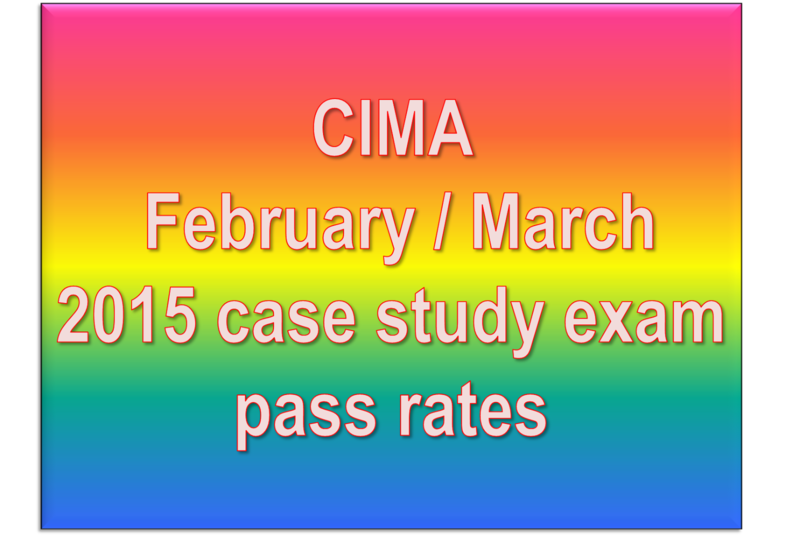 CIMA mentioned that " ‘A small number of candidates chose to sit the exams during this first window and the resulting pass rates are in line with expectations. We anticipate that pass rates will rise as larger numbers sit the case study exams. Each exam window will generate further study material and we hope this will further increase student confidence." 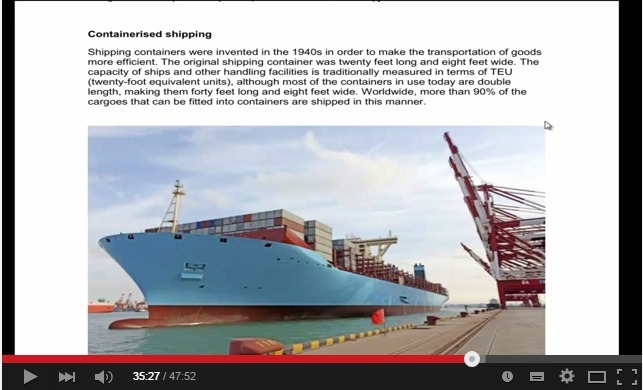 To find out the full video series and Pre-Seen Analysis.